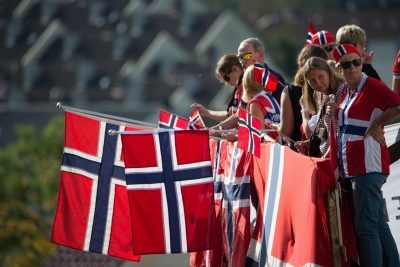 Just two weeks after Norway’s annual display of enthusiastic patriotism comes news that a majority of Norwegians think their own culture is better than that of other countries. Norway was the only country of 15 Western European nations polled where more than half suggested cultural superiority. People questioned in Spain, meanwhile, were at the other end of the scale, with only 20 percent supporting the statement. In neighbouring Sweden, only 25 percent think their culture is best. The only country that comes close to Norway’s response is Switzerland, where 50 percent find their culture superior. Switzerland, like Norway, has never joined the European Union either. The Pew Research Center interviewed 24,000 residents in the 15 countries for its survey entitled “Being Christian in Western Europe.” Among them were 1,500 Norwegians over the age of 18 who were chosen at random. The survey, which also showed Norway as having the lowest percentage (just 5) of church-attending Christians, nonetheless found that Christian identity in Europe remains a religious, social and cultural marker. Some may argue that Norway’s numbers simply represent Norwegians’ great sense of pride in their country and their systems, despite all the political quarreling that goes on every day. Professor Thomas Hylland Eriksen at the University of Oslo suggests otherwise. Others argue the attitude can quickly become viewed as nationalistic in nature, and protectionist as well. Norway’s Center Party, which caters to a rural constituency and led the campaign against joining the EU, has seized on such attitudes in its efforts to protect farmers, glorify Norwegian-produced food and fight to keep remote areas populated. Moe, who recently became entangled in a sexual harassment case, argued that Norwegians’ “common arenas and reference points” are fewer than they were just 30 years ago. That makes it more important than ever, according to Moe, “to take care of what we have.” Despite increased diversity within Norway, the days of a strong national state are far from over, he claimed, adding that Norwegian identity and a sense of belonging tied to fellowship remain critical to ongoing development of the nation. Moe and many others have argued that Norwegian culture and values are under pressure, but the country still ranks high on lists about the planet’s happiest people and in which country it’s best to live. Top spots on such lists are often shared with other Nordic countries. The Pew report showed that 49 percent of people questioned in Finland think their culture is better than others’, while 44 percent of those in Denmark felt the same. Norwegians remained the most satisfied.